The Isle of Berneray and surrounding area of North Uist offer a wide range of opportunities for those wishing to enjoy fresh air and the outdoors. 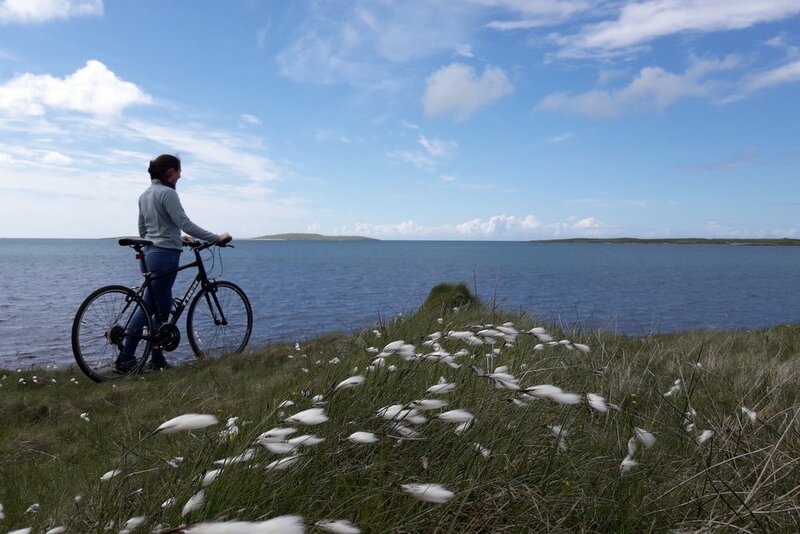 From the beaches of Berneray to the moorlands and hills of North Uist there are plenty of options for getting active and engaging with the natural surroundings. As a family we run Ocean Guides which takes small parties into the Sound of Harris and to off shore uninhabited islands to experience the wilderness, culture and marine life of this unique environment. We are very happy to organise bespoke tours that match individual and group interests. Further information can be found on our website but please contact us if you wish to discuss specific details. The quiet (and relatively flat) roads of Berneray and North Uist make for a very pleasant day out cycling. Pack your picnic and swimming costumes and take some exercise along the way either just across the island or press on to a beach in North Uist. A wonderful way to see the lay of the land and not miss out on spotting wildlife on route. If you would rather not travel with bicycles you can hire them from Berneray Bikes, who also offer our guests a small discount. The Visit the Outer Hebrides: Tourism Information website has information on the Hebridean Way Cycling Route if you wish further details. Berneray’s 3 mile long white sandy beach offers plenty of scope to stretch your legs. Indeed, much of the West coast of North Uist is a long trail of empty white beaches too many to list but with wonderful opportunities for exploration. If you wish to get an ‘eagle’ eye view you could consider climbing Eaval on the East coast of North Uist and the highest hill within the vicinity. From there, you will be able to look East across the Minch or West to the peat bogs of Langass moor, croft land and out to the Atlantic. The Visit the Outer Hebrides: Tourism Information website has several very handy PDF walking leaflets to download and information on the Hebridean Way if you wish further detailed information. For those keen anglers there are plenty of moorland lochs and sea pools on which to pass the day flogging the water. 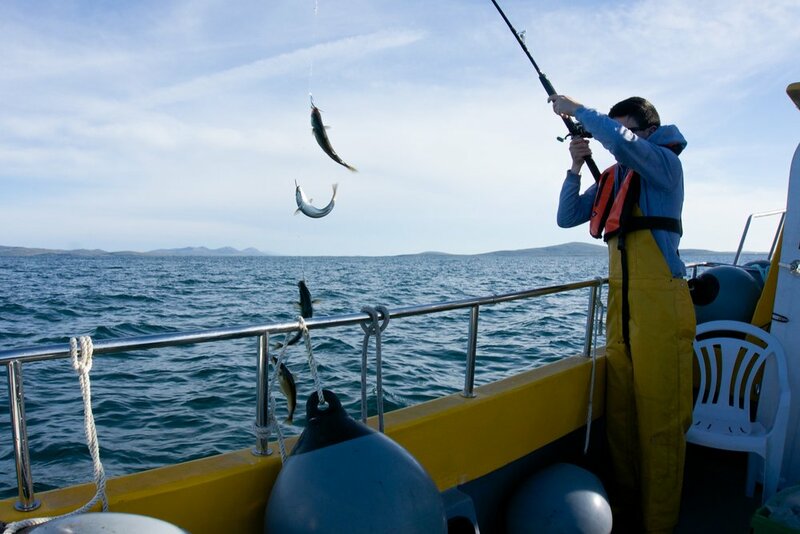 Ocean Guides will also happily take you out sea fishing for your tea. During your stay we can supply locally caught seafood such as lobster, crab or langoustine. Availability will depend on the season and weather but we will be happy discuss options on your arrival. Otherwise, you can eat out at Langass Lodge, Hamersay House and Lochmaddy Hotel which are only 15-20 mins away by car. Claddach Kirkibost on the West side of North Uist has a very welcoming café serving snacks and lunches. The Hebridean Smoke House sell peat and beechwood smoked trout, salmon and scallops. The islands of the Outer Hebrides have a fascinating history dating back thousands of years. Whether it is the Neolithic burial chambers and standing stones left untouched in the landscape or more recent social history relating to Vikings, the Lord of the Isles or the clearances, there is certainly plenty to learn and visit. Around 60% of the local population in the Uists still speak Gaelic. This can be heard in the shops and on the ferries as people go about their daily lives. Music and ceilidhs (traditional dances) are very much enjoyed in the islands and you might just be lucky enough to experience this on your holiday, a memory you are sure never to forget. Taigh Chearsabhagh Museum and Art Gallery is situated in Lochmaddy and has a calendar of cultural and arts events along with a café and craft shop. Kildonan Museum in South Uist is a heritage and cultural amenity with a museum, café and craft shop run by the Uist Craft Producers.